Applied research generates improvements, not breakthroughs. 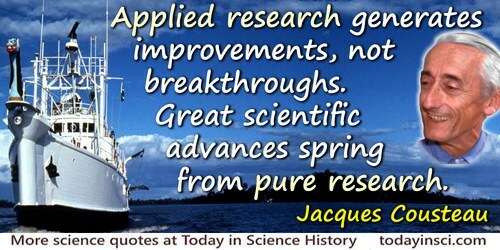 Great scientific advances spring from pure research. Even scientists renowned for their “useful” applied discoveries often achieved success only when they abandoned their ostensible applied-science goal and allowed their minds to soar—as when Alexander Fleming, “just playing about,” refrained from throwing away green molds that had ruined his experiment, studied them, and discovered penicillin. Or when C. A. Clarke, a physician affiliated with the University of Liverpool, became intrigued in the 1950s by genetically created color patterns that emerged when he cross-bred butterflies as a hobby. His fascination led him—“by the pleasant route of pursuing idle curiosity”—to the successful idea for preventing the sometimes fatal anemia that threatened babies born of a positive-Rhesus-factor father and a negative-Rhesus-factor mother. In Jacques Cousteau and Susan Schiefelbein, The Human, the Orchid, and the Octopus: Exploring and Conserving Our Natural World (2007), 214-215. Chance throws peculiar conditions in everyone's way. If we apply intelligence, patience and special vision, we are rewarded with new creative breakthroughs. Told to his Harvard students. As quoted, without citation, by Marcus Bach, 'Serendiptiy in the Business World', in The Rotarian (Oct 1981), 139, No. 4, 40. If you know a primary source, please contact Webmaster. Formula for breakthroughs in research: Take young researchers, put them together in virtual seclusion, give them an unprecedented degree of freedom and turn up the pressure by fostering competitiveness. In James Beasley Simpson, Simpson's Contemporary Quotations (1988), 145. In Michael Dudley Sturge , Statistical and Thermal Physics (2003), 139. Perhaps I can best describe my experience of doing mathematics in terms of a journey through a dark unexplored mansion. You enter the first room of the mansion and it’s completely dark. You stumble around bumping into the furniture, but gradually you learn where each piece of furniture is. Finally, after six months or so, you find the light switch, you turn it on, and suddenly it’s all illuminated. You can see exactly where you were. Then you move into the next room and spend another six months in the dark. So each of these breakthroughs, while sometimes they’re momentary, sometimes over a period of a day or two, they are the culmination of—and couldn’t exist without—the many months of stumbling around in the dark that proceed them. Quoted in interview for website for PBS TV Nova program, 'The Proof'. We are a caring nation, and our values should also guide us on how we harness the gifts of science. New medical breakthroughs bring the hope of cures for terrible diseases and treatments that can improve the lives of millions. Our challenge is to make sure that science serves the cause of humanity instead of the other way around. Telephone remarks to the March for Life, in Public Papers of the Presidents of the United States: George W. Bush, 2007 (), Book I)President Calls March for Life Participants (22 Jan 2007), 41.